The practice of incorporating historical or “real-life” events in a fictional work is common. But the term “documentary fiction” isn’t one I’ve often heard applied to a novel. So I Googled it and came up with a New York Times article titled “ ‘Documentary’ Fiction.” The article begins: “The question of historical fiction has been tremendously threshed over these last months. Very likely there is nothing new left to say about it.” The article, dated October 12, 1901, goes on to discuss Rudyard Kipling’s work. Clearly, authors and audiences have a long and complicated relationship with history, storytelling, and “the truth.” Right now, our pop culture is fairly obsessed with the concept of reality. But while celebrity blogs and TV shows like The Hills, Jersey Shore, and The Bachelorette may operate under an overarching premise of reality, they are often purposefully ambiguous regarding what events in their narratives are real or staged. These programs are very different in their content, message, and intended audience from historical fiction, memoirs, biography, and Winter’s documentary fiction. But perhaps the proliferation of multiple mediums that simultaneously entwine, yet differentiate between fiction and fact speaks to a persistent and increasingly fraught cultural preoccupation with one’s ability to identify truth. On the other hand, maybe an ambiguity between fact and fiction simply contributes to quality of storytelling. We read and write stories to learn about ourselves, others, the world we inhabit. Is there value in attempting to define or identify why and how we blur the categories, or should we embrace E.L Doctorow’s sentiment that “[t]here is no fiction or nonfiction as we commonly understand the distinction: there is only narrative.”? 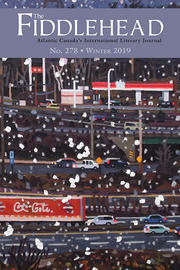 In choosing to write documentary fiction, Winter may satisfy cultural desires for both fact and story, which in turn allows him to tell Whalen’s story in a way that resonates deeply with his audience. — Her first novel, Quiver, is forthcoming with HarperCollins in January 2011.